I have created a sample lightning app which display different charts by using salesforce data. I am going to display opportunities amount(in millions) grouped by forecast category. First of all store the Chartjs file in static resource in order to use it in lightning components. You can download complete code along with static resource from below Github repository and deploy to your org. Below is sample code used to display charts in above snapshot. Salesforce provide different kind of Icons which can be used in Lightning component. 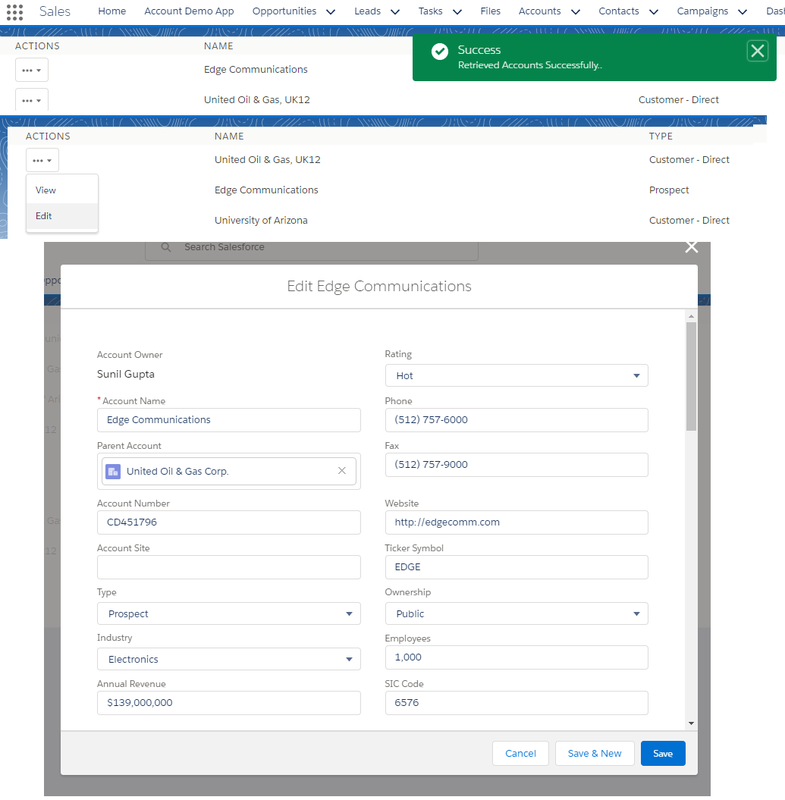 As now we have an option to include slds in Visualforce pages, we can utilize predefined Icons in Visualforce page. Icons have been divided in 5 different categories (Standart,Utility,Custom,Doctype and Action). In this blog we are going to explore how to utilize these icons in VF page. Icon background color(.slds-icon_container) : This is used to provide background color to icon. By default, (.slds-icon_container) has a transparent background. In order to provide backgroud similar to specified in icons in SLDS, use .slds-icon-[cateory name]-[icon name] class. For example, for account icon, I need to provide background, then use .slds-icon-standard-account class. Note that doctype icons have specific colors that cannot be changed with the CSS property. Below is sample VF page code which display different svg icons belonging to different categories. Salesforce provide predefined events by which lightning components interact with Salesforce 1.You can utilize these events in Salesforce 1 app or in in lightning container(lightning experience). This can be used to display some message on UI. For example, you are loading records from server side on your components, then you can display message saying "Records are loaded successfully" when operation completed. Yo can also control the duration for which this message will be displayed on screen. This can also be used to display error, warning or info message. You can control the appearance of toast message by using type attribute. ////checking if SF1 event exist or not. "message" : "Retrieved Records Successfully.."
This event can be used to redirect user to record detail page by specifying the recordId. This will open related list of record( specify the parent record id for related list). This will navigate to record edit page specified by recordId. This event will refresh the complete UI. So if you perform any operation and then want reload the component, then you can utilize this event. Below is sample code utilizing SF1 events. This component displays list of account records and allow user to navigate to record detail page and edit page by using SF1 events. I had started planning for Salesforce Application Architect journey in Nov, 2017. As in order to achieve this, I need to passed below mention 2 exam as other required exams I had already cleared. As Sharing and security is my favorite, so I start preparing for "Certified Sharing and Visibility Designer" exam. It took almost 1 month for preparation and finally I cleared first architect exam on 30 Dec, 2017. Through this blog, I am going share my preparation experience and tips for everyone who all are planning for this. For self study, please refer Resource Guide for Sharing and Security, which contains all the study material links for different topics. If you complete this, then you are ready for this exam. Please do practice on all topics related to declarative sharing and programmatic sharing. Candidate must have complete understanding of different record sharing in built functionality like OWD, Role Hierarchy, Sharing Rules, Manual Sharing, Teams, Territories etc. Custom permissions, Profiles and permission sets. As I was not able to do practice on Territories, I just went through Salesforce help section for territories. Important topics are difference between Territory management(1.0) and Enterprise Territory Management (2.0) and their capabilities. Must do practice on Account Teams and Opportunities. Different scenarios like who all can add team members, who can change record owner, what level of access can be given to user considering object OWD setting etc. Permission required for creating list views and with whom all list view can be shared. Custom settings, named Credentials and Custom metadata. Ownership Skew, Lookup Skew and Account Skew and their impact on performance. Always remember that manual sharing of record or manual sharing created through apex get deleted when record owner changes. Differences between shield and classic encryption. Record Access Grants(Implicit grant, Group membership grant, Inherited grant and explicit grant). Reports and dashboard folder access and permission required to manage this. Also cover different types on file and folder access permissions. Always remember that External default sharing level of object should be equal to or less restrictive than internal default sharing level. Public groups (who all can be added and how access can be restricted to higher role using public groups). How to force object permission and FLS in apex and VF page (using schema describe methods). Granular locking: Usually group membership get locked if any configuration happens. This will make impossible to perform group membership changes during this lock period. If Granular locking feature is enabled then system will lock portion of records instead of locking entire Group maintenance table. This allow multiple update simultaneously if there is no hierarchical or other relationship between the roles and groups involved in the update. Parallel Sharing rule calculation: If Salesforce perform any activity (maintenance or upgrade) then all sharing recalculation jobs get killed. In order to avoid this, consider enabling parallel Sharing Rule calculation. This will split the job in multiple threads which will run asynchronously. If Salesforce perform any activity, these jobs will not be killed and resume after salesforce activity. Deferred Sharing Calculation : Best fit if you can buy out maintenance window from live user. Once you enable this, system will not perform any sharing calculation and you can perform major configuration changes like role changes, public group reassignment etc. Avoid Account data skew, lookup skew and ownership data skew.